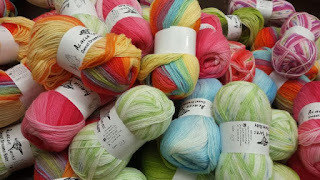 Ever since Kate Jacobs published "The Friday Night Knitting Club" we thought, probably like many other yarn shops, that it would be cool to have our own Friday Night Knitting Club. 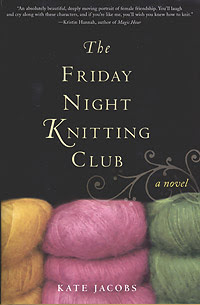 For those who do not know about it The Friday Night Knitting Club by Kate Jacobs is a touching tale of women joining together in a common love of knitting and each other. Georgia Walker is a single mom whose life revolves around her 12-year-old daughter, Dakota, and her small knitting shop, her life is busy, but lonely. But all that's about to change in ways she never expected. Of course our Friday nights are not necessarily producing book making material, but our wonderful host for the evening is the talented Gina, knitter, blogger and host of a popular online pod-cast. Could we wish for more! Friday Nights are Hosted by Gina!